"Welcome to Warrior Territory, where pipe tobacco costs far less". Warrior Pipe Tobacco is the Seneca Manufacturing Company's most unique and well-crafted brand, designed to honor SMC's Native American traditions. Each blend of Warrior Pipe Tobacco offers smokers a full-bodied flavor that once ignited, burns slowly and consistently giving no harshness, allowing for a milder experience. 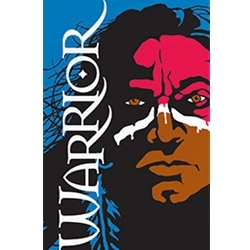 What make this high quality tobacco so enjoyable to lite up, Warrior was conceived from a balance of secret blends of rich and pleasant natural tobacco flavors perfected centuries ago from ancient Native Americans. Smokers who love using an excellent premium tobacco like Warrior, due its ability to stay lit easily offering an all-day smooth and mellow taste, with pleasant aromatic room notes. A solid value as a pipe smoker’s best friend. Warrior Pipe Tobacco is distributed nationwide by Seneca Manufacturing Co., Salamanca, NY, Seneca Nation USA. Each pouch of Warrior Pipe Tobacco are available at our online tobacco store in in a variety of flavors: Full Flavor, Light and Menthol. Warrior Pipe Tobacco is an excellent choice for smokers looking for a relaxing way to enjoy a great quality smoke at an inexpensive price. Here at Smokers Discounts we’ve made it easy and affordable to buy pipe tobacco online. Call us for more details!